Selective breeding is rather common nowadays, getting characteristics that the breeder desires. It also results in harmful genetic mutations, often resulting in unhealthy animals, such as with dog breeding. There has also been discussion of bringing back extinct animals (which would be an exciting possibility when usable dinosaur DNA is found). One such case is a "prehistoric" horse, such as those seen in cave paintings. There is an extinct breed called the Tarpan, which had a resemblance to the critter pictured above as well as the cave paintings. People began breeding from wild mustangs that had some of the characteristics. 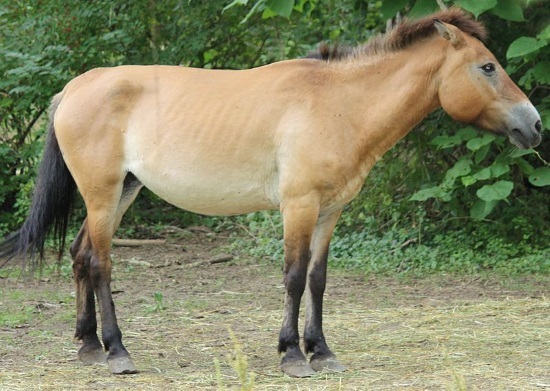 Interesting that they did it without crossbreeding with the Przewalski's horse. This gives some insight not only into DNA, but also into the created biblical kinds. This is not evolution, since it involves variation and no added genetic material. Previous articles in Creation have dealt with depictions of so-called ‘prehistoric’ animals in cave paintings around the world. While we recognize many of these creatures because they are still alive today, others are apparently extinct. The ‘prehistoric’ label reinforces the idea that many types of creatures lived and died before mankind came on the scene. But starting with the real history in Genesis, we can be sure that the beginning of earth history was also the beginning of human history, so there has never been an era of prehistory in that sense! What would it be like to see a ‘prehistoric animal’ from a cave painting alive? Well a couple from central Oregon, USA, do that every day! Back in 1990, Lenette and Gordon Stroebel bought a herd of 20 Tarpan-style horses with a view to breeding horses that we typically associate with cave paintings. Other cave paintings of horses resemble Przewalski’s horses . . . They carry on a breeding project begun in the 1960s by horse lover Harry Hegardt. His efforts to recreate a ‘prehistoric’ horse from wild American mustangs eventually resulted in something closely resembling the original Tarpan. The Stroebels have continued where he left off. To read the rest of the article, click on "Resurrecting a ‘prehistoric’ horse".